If you are a fan of the medium and are in the market for a new podcast app, there are many apps of this type offering to enjoy an audio content on the go, directly on your phone, listening to your favorite topics that suit your taste. Because of the popularity of these apps, we decided to make the search easier. We looked and we found for all of you lovers of audio content an incredible podcast app that offers you all this and much more. Let’s see what the app is all about. What is Fallound all about? 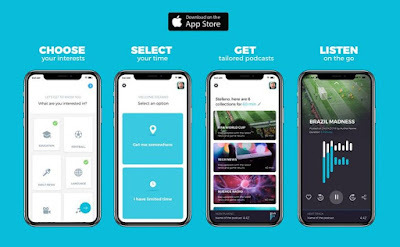 Fallound is offering all lovers of podcasts and audio content an incredibly podcast app that they can use to discover news, podcasts and other audio content to listen during their commute. The app is developed for iOS users as very easy to use, user-friendly with a clean interface that allows them to search audio content depending on their interests. Just by selecting their destination and the time they have, the app will instantly show the content, anytime and anywhere the users want to enjoy it. This podcast app and the various interesting features offered on it will make your commute experience quite enjoyable, whenever you want to listen to audio content, news, and podcasts. This app works very simply, the user just needs to initially choose his interests and he will be able to discover topics such as finance, politics, sports, technology and more. The app is offering a huge database for everyone’s taste and many categories. The next thing is for the user to select his destination and the app is calculating the time needed for him to arrive there and based on that is offering news and podcasts to listen to. Users will easily discover podcasts and find timed episodes available for their commute. Select between the destination option to find audio content, or choose the limited time option to discover content depending on the time you have. Enjoy audio content during your commute and constantly discover topics you will like depending on your preferences. Download it for free on App Store now to enjoy listening to audio news and podcasts during your commute!